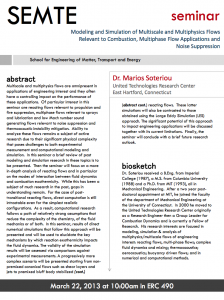 Multiscale and multiphysics flows are omnipresent in applications of engineering interest and they often have a controlling impact on the performance of these applications. Of particular interest in this seminar are reacting flows relevant to propulsion and fire suppression, multiphase flows relevant to sprays and lubrication and low Mach number sound generating flows relevant to noise suppression and thermoacoustic instability mitigation. Ability to analyze these flows remains a subject of active research due to their significant physical complexity that poses challenges to both experimental measurement and computational modeling and simulation. In this seminar a brief review of past modeling and simulation research in these topics is to be presented. 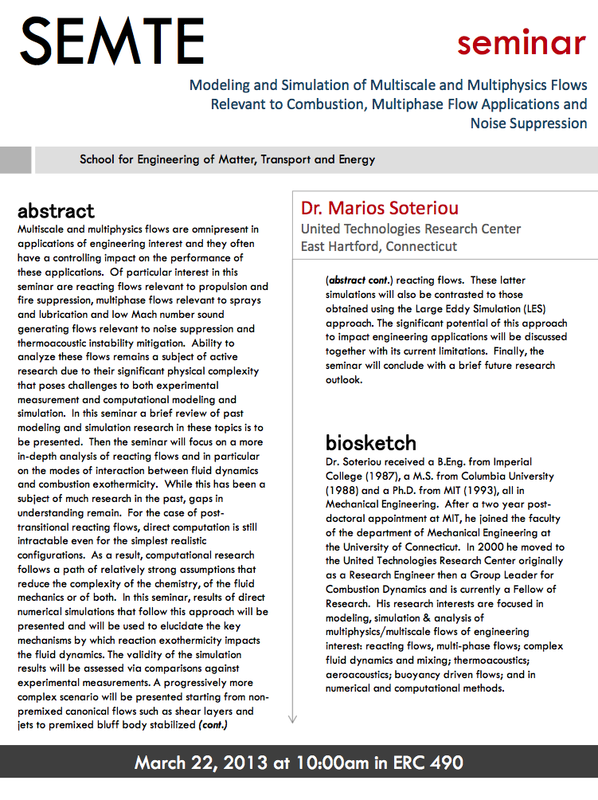 Then the seminar will focus on a more in-depth analysis of reacting flows and in particular on the modes of interaction between fluid dynamics and combustion exothermicity. While this has been a subject of much research in the past, gaps in understanding remain. For the case of post-transitional reacting flows, direct computation is still intractable even for the simplest realistic configurations. As a result, computational research follows a path of relatively strong assumptions that reduce the complexity of the chemistry, of the fluid mechanics or of both. In this seminar, results of direct numerical simulations that follow this approach will be presented and will be used to elucidate the key mechanisms by which reaction exothermicity impacts the fluid dynamics. The validity of the simulation results will be assessed via comparisons against experimental measurements. A progressively more complex scenario will be presented starting from non-premixed canonical flows such as shear layers and jets to premixed bluff body stabilized reacting flows. These latter simulations will also be contrasted to those obtained using the Large Eddy Simulation (LES) approach. The significant potential of this approach to impact engineering applications will be discussed together with its current limitations. Finally, the seminar will conclude with a brief future research outlook. Marios Soteriou received a B.Eng. from Imperial College (1987), an M.S. from Columbia University (1988) and a Ph.D. from MIT (1993), all in mechanical engineering. After a two-year postdoctoral appointment at MIT, he joined the faculty of the Department of Mechanical Engineering at the University of Connecticut. In 2000 he moved to the United Technologies Research Center originally as a research engineer then a group leader for combustion dynamics and is currently a Fellow of Research. His research interests are focused in modeling, simulation and analysis of multiphysics/multiscale flows of engineering interest: reacting flows, multi-phase flows; complex fluid dynamics and mixing; thermoacoustics; aeroacoustics; buoyancy driven flows; and in numerical and computational methods.